I did a fair bit of talking about skate equipment this past year as I documented my transition from Atlas Plates to Roll Line Plates (and something of a transition back on my loop skates). I thought it might be fun to do something of a series on skating equipment and the options available. Since I am an artistic skater these posts will focus on artistic skating needs – I won’t be dealing with the vast options available to those who specialize in speed, hockey, or derby, whose equipment needs are very different from my own. So – let’s get to talking about wheels. The skate wheel is (or at least should be) the part of the skate that comes in contact with the skating surface most often, so in some sense it has the greatest impact on how a skate “feels” on a particular surface. Skating surfaces vary from slick to tight, from rough to glass-smooth. The floor type (wood, cement, etc. ), coating (various types of plastic varnishes), and upkeep will determine how the floor feels. Though everyone loves a tight, fast, smooth floor this isn’t always an option. And you can’t change the skating surface. You can, however, fairly easily change your wheels. As far as skating equipment goes, the wheel is (most often) the cheapest component of the skate. Since the wheels have to deal with constant friction, they tend to wear down the quickest, and need to be replaced more frequently than any other skate part (except perhaps for toe-tops on freestyle skates). In general most skaters I know replace their wheels once a year (around May/June before summer competitions), though many skaters have a “practice set” of old beat up wheels and a “competition set” of nice shiny new wheels. Most freestyle and some dance skaters (and maybe a few figure skaters) carry multiple sets of wheels in various hardnesses so they can quickly adjust their skates to the rink conditions. There are two numbers to pay attention to with wheels – diameter and durometer. The diameter is the size of the wheel. Most wheels are 57mm (small, often used for freestyle or by young children) or 63mm (large, used for figures and dance). 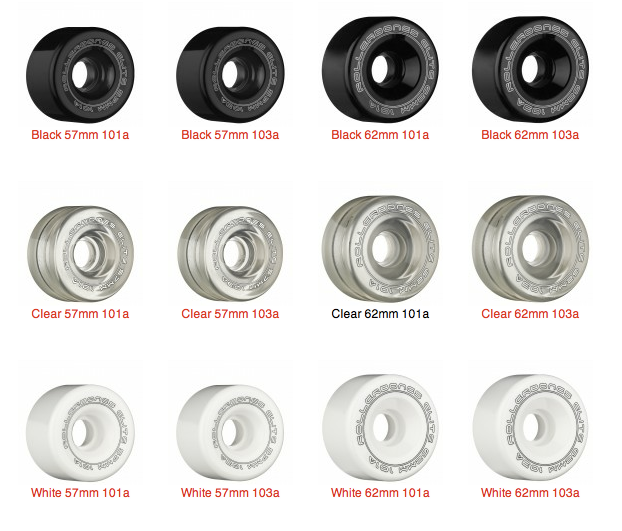 Some wheels also come in 55mm (freestyle wheels), 60mm (loop wheels), or 62mm (dance wheels). The smaller wheels keep your balance point closer to the ground, which can make it easier to balance when doing tricky things like spinning or landing jumps. The larger wheels will give more roll with less effort by the skater, which is important for things where you will be balancing on one foot without pushing for long periods of time (for dance and figures). The “hardness” or “durometer” of a wheel will determine how it feels on the floor. The higher the number, the harder the wheel, and the more slippery it will feel when you skate on it. As with many things you are trying to find the perfect balance – too slippery and you will feel unstable, too sticky and you will feel like you are skating through peanut butter. There are two scales – a plastics D scale (usually ranges 35-65) and a urethane A scale (usually ranges 80-105). Often these numbers are not consistent between companies, so a 96 from one brand may be softer than a 95 or even 92 from another company. This can make it had to determine what to order when you want to try out new equipment, but if you get lucky you can often test out the equipment of others before investing in some for yourself (not always an option, but nice when it does exist). Roll Line equipment has taken the skating world by storm the past few years – their wheels seem to be the most popular in artistic skating circles by far. They are mainly carried and distributed by SkatesUS and they have several varieties that are intended for specialized purposes. Figures – For figure skating (tracing the circles) Roll Line offers Giotto and Magnum wheels, in various hardnesses. In general, you want the figure wheel to be as slippery as possible so that you reduce friction and travel around the figure circle with minimal effort. However, some skaters find the slippery wheels hard to push with, and either use one of the lower numbers or use a combination of hardnesses so they can have a “push wheel” to get extra traction. Personally, I prefer the 61D 63mm Giotto wheels – they can be a bit slippery to push, but I find that they have the best roll and are excellent for performing turns. I don’t really care for push wheels; I find that the inconsistent wheel material creates a weird drag when doing turns and it makes it very difficult to get a perfectly balanced shape to the turn. I have found that the Giotto wheels tend to hold up very well – I usually only have to replace them once every 2-3 years, and I am a fairly obsessive figure skater. The edges do tend to round after doing a lot of loop skating, but only after very heavy use. I have tried the 60mm loop wheels, but I did not like them. I found the shift in the balance point made it difficult to get the roll I like to have around the crown of the loop, and I thought there was too much slow down when I was doing paragraph loops (two circles with one push). I do know other skaters who like having the lower balance point though, and find that the loop wheels help them quite a bit. They tend to be a bit shorter and smaller than I am though. I don’t know anyone who uses the Magnum wheels, and have never tried them, so I can’t really comment on how they feel or wear. Dance – For dance skating it seems that Roll Line’s most popular wheels are the Grease dance wheel, which are 63mm and come in three hardnesses – 97A, 95A, and 92A. 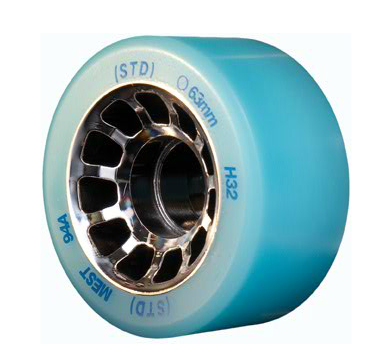 They also offer a few wheels in 62mm sizes – Olympic Blue (93A), Forester Gold (90A), and Formula 88 (88A). Most skaters who use the Roll Line wheels seem to like the 95A Grease wheel. I have been using this wheel for the past two years or so, and I really rather like it. It feels stable and grippy, while still having enough slide to do some nice turns. Some people (myself included) like to mix hardnesses on the Grease wheels – using a checkerboard combination of tighter wheels on the inside front and outside back and slicker wheels on the inside back and outside front. Since I have been skating on some fairly tight floors this year, I have been using a combination of the 95A/97A wheels, and switch to all 95s when I encounter a slippery surface. Although some people would count this as a negative, I really like the width on these wheels. I feel like the size adds extra stability when skating fast and deep edges. However, I do know some people who find these wheels to be incredibly slow and there are some coaches who think that they should only be used by world class dance skaters. Luckily I have a coach with the opinion that the skater should wear what is best for them, and has been amenable to me trying out different equipment over the years. These wheels also seem fairly robust, though I do notice that the edges round down more quickly than those of my figure skates. I usually need to replace my dance wheels about once a year, sometimes twice. Although I really like these wheels it seems that, unfortunately, there is a new design this year that seems to produce a lot of whistling and whining. The fins on the inside hub are now curved and there is some speculation that this could be the culprit. Others swear that the noise goes away after you break in the wheel. My new set of wheels make a ton of noise, and I find it incredibly annoying, but I am hoping that a prolonged break-in period will help this problem go away. Only time will tell. Freestyle – Since I am not a freestyle skater I don’t have any first-hand experience using these wheels, but I do know a lot of people who use them. Most freestyle skaters tend to have at least one set of each hardness of wheel – Leopard (99A), Mustang (97A), Panther (95A), and Fox (92A) – and many skaters mix and match to get the correct feel for spinning and landing jumps. The most popular hardnesses seem to be the Mustang and Panthers, though I know just as many people with Leopards and Foxes, so it is difficult to say which wheels are the most popular. These wheels also come in a “Light” version which is 55mm in size (as opposed to the normal 57mm), though I have heard that the Light versions also make the whining noise, and I don’t know anyone who uses them. Roll Line also offers 57mm Giotto and Magnum freestyle wheels, but I don’t know anyone who uses these either. One thing of interest – while dance and figure skaters always seem to want to discuss the hardness in numbers, the freestyle group only seem to know the wheels by their animal names. One time I was helping someone change wheels and I was asking if they wanted 92’s or 95’s on their skates and all I got was a blank look. Pros: Overall Roll Line wheels seem to be the top wheels on the market. They have wheels for every discipline in multiple hardnesses and sizes which make it very easy to find wheel to suit each individual skater. Their wheels are very popular, so it should be fairly easy to borrow wheels from someone to test them out for yourself. In general I would say that these wheels are well designed, work well, and last a reasonable amount of time. Cons: As with many things, you often end up paying more for the brand name. I would say that Roll Line Wheels tend to be on the more expensive end of skate wheels, but I would also say that you get what you pay for. However, for people who like to mix-and-match wheel hardnesses, the cost can add up in a hurry since you can only buy Roll Line wheels in full sets of 8. That means if you want some push wheels for figures you are going to have 6 extra wheels sitting around. Which, in theory you will use eventually, but it does make the expense much greater up front. Some people complain that the wheels tend to get flat spots very easily, but I have only had that problem when I had to do a quick t-stop when I was going very fast to avoid a collision. Harder wheels will tend to get flat spots more easily than softer wheels, and it does seem that the newer the wheel, the more likely it is to get a flat spot. These wheels also tend to discolor within a year, which bothers some people more than others (not something I am overly concerned with, but some people dislike the yellow/green color these wheels turn with age). The other problem seems to be this new issue with the whining noise. It remains to be seen if this will be resolved, but it looks like many skaters are starting to search for alternative wheels because of this annoyance. The Komplex wheels are the latest wheels to hit the skating world. The company started with skating wheels, and seems to be expanding to other skate parts like bearings, toe stops, and (eventually) skating plates. To my knowledge, the wheels were first seen at the US Nationals last year, and seem to be quickly spreading in popularity. Like Roll Line, Komplex has a full line of wheels for each skating discipline. It is rare to see a new company break into the skating world and have their products become so popular so fast. I think a competitive price point and endorsements by many world team members have helped these wheels become quite popular quite fast. It seems that many skaters in other countries have been testing out these wheels as well, and most people seem to be giving them favorable reviews. Figures – Komplex offers their 63mm Angel figure wheel in several hardnesses. I was able to test out some Angel wheels recently (52 hardness, with 51 hardness push wheels). I found that these wheels offered excellent grip for pushing (almost too much since I am so used to my super slick Giotto wheels) while still having a nice slide on the turns. However, I also found that these wheels tend to lose their roll much faster than the Giotto wheels do. I was able to get a stronger push and was going much faster at the start of the figure, but lost a lot of roll and ended the figure slower than in my Giotto wheels, despite having a stronger push to begin with. I was not able to test these wheels out for loop skating, however, but because the loop circles are smaller it is possible that this loss of roll would not have as large an impact. I would love to test out the hardest Angel wheel (56) to see how it compares with the hardest Giotto wheel (61), though in general I think I will stick with my Giottos. I do think it might be worth testing out a set of the 52s on loops at some point in the future though. Dance – There are two types of Komplex dance wheels at the moment – Bolero wheels and Tango wheels. I have been lucky enough to test out some of each. The Tango wheel are only recently released to the market and are on the urethane A scale. I tested out the hardest of these wheels – the 96A yellow Tango wheels. I really liked the size/shape/feel of this wheel but it was incredibly slow. I think these wheels should only be used on the slickest of surfaces, and honestly I would recommend the Roll Line Grease 92A wheels over the Tango 96A wheels if you need something for a slippery surface (noise problems and all). Of course, you could always use these for strength and endurance training – it takes a LOT of effort to go anywhere on these wheels! I do, however, rather like the Bolero dance wheels – I have been using a mix of the 40 and 43 hardnesses, and this has provided nice roll with enough stability due to wheel width but also enough slide on the turns. I think I would recommend the 40 hardness in general, and the 43 hardness only if you are skating on a very tight floor. These wheels feel slightly more slippery than the Roll Line Grease wheels, but the initial slickness seems to wear off after the wheels have been skated in for a while. It does seem that these wheels flat fairly easily, especially when they are brand new. In general I really like these wheels and they are absolutely silent – no noise problems like the new Grease wheels! Freestyle – Again, I haven’t tried these myself, but I have seem more and more skaters trying them out. As with the dance wheels there are two types (both 57mm) – the freestyle Angel wheels and the freestyle Ghibli wheels. The Angel wheels range in hardness from 38 – 56, providing the largest durometer range of any wheel brand that I am aware of. The Ghibli wheels look to be made out of the same compound as the Tango wheels, so I can only assume that they will feel similarly grippy and slow (possibly a good thing for skaters trying to land jumps on very slick surfaces). Most skaters using these wheels seem to have a mix of 45/48 hardnesses, though I have seen a few with a mix of three or more hardnesses on their skates. Freestyle skaters tend to go through wheels the fastest (spinning tends to round down the wheels quite a bit), but from what I have seen it looks like the Komplex wheels tend to flat or wear faster than the Roll Line wheels. Pros: These wheels are less expensive than the Roll Line brand wheels, and in most cases come in a wider range of hardnesses. When you order wheels, you can order a full set of 8, or you can order a customizes set, and specify how many wheels of each hardness you want – making it very easy to get a set of figure wheels with push wheels, or get a mix-and-match set of freestyle and dance wheels. They seem to be growing in popularity, so it should be fairly easy to find a set and test them out. Cons: Each wheel hardness comes in its own distinct color. While the most popular versions tend to be made in the white or neutral grey shades, mixing and matching wheels can tend to make someone look like they are skating on a bunch of fruit loops. Some coaches (and skaters) might not like this crazy colorful look, and might not want to go with these wheels because of it. I know a few skaters who won’t try them because they only come in 57mm size and not 55mm. Also, it seems these wheels flat very easily, and because of that they might need to be replaced more often than the Roll Line wheels. It is debatable if these wheels have better roll than the Roll Line wheels, some skaters feel that they do and others feel that they don’t. From my experience it seems that the amount of grip and roll of these wheels varies much more with the hardness of the compound than do the variations in the Roll Line wheels, so it might take a skater longer to find exactly the right combination of wheels for them to feel comfortable. The Roller Bones Wheels have probably had the greatest staying-power in the wheel market – they were popular when I started skating over a decade ago, and they are still popular today. The Roller Bones wheels are used mainly for dance, although there are a few people who still like them for freestyle. They aren’t really used by experienced figure skaters too much as they tend to be a bit too sticky. They are an excellent wheel for a new artistic skater who doesn’t yet have specialized skates – these wheel probably have the best combination of grip, roll, and slide of any wheels on the market today. These wheels used to come in a wider variety of hardnesses (98A, 101A, and 103A) and colors (white, black, whiskey, red), but now seem to only come in 101A and 103A in black, white, and clear. There are two sizes (57mm and 62mm), and two varieties – the Elite and the Super Elite. The Super Elite have a plastic hub for the bearings (this is awesome – you can literally press them in by hand) but also come new with grooves around the outside of the wheel. The wheels feel really slow until the groves get worn down, which can take weeks or even months of skating. I prefer the Elite wheels – no grooves so they are super fast out of the package, and cheaper to boot. Personally I like the 101A wheels over the 103A wheels, but I know people who won’t skate on anything other than 103s. Pros: These are probably the fastest wheels on the market. People who have been skating on other wheels will put these on and fly around the floor. This is why so many skaters like them for dance. These are also probably the best multi-task wheels, so I think they are great for skaters who are just starting artistic skating because they will good if you are using one set of skates for figures, dance, and freestyle. Also, the price is decent and these wheels tend to last a long time. There are fewer flat spot issues than with other wheels, so they are a good investment. And, although this is rather vain and somewhat trivial – these wheel (especially the white ones) look very pretty on the floor. They tend to retain their original color much better than the Roll Line wheels. Also, in the ever changing skate wheel market, you know something with this much staying power has to be good. Not to mention that practically everyone has a set lying around – so it should be really easy to find some and try them out. Cons: Despite all the good points this wheel has going for it, I don’t actually enjoy skating in it all that much. Although the part of the wheel that contacts the skating surface is actually wider than the Roll Line or Komplex wheels, because of the design, on the skate it actually feels the most narrow (Komplex and Roll Line have a tapered edge on the backside of the wheel that push it out farther onto the axel of the plate). Personally, I do not like this. Some skaters prefer this because the feel less likely to trip when doing footwork, but I find it makes me feel like I am going to slip when skating on deep edges. Also, on the Roll Line plates especially, you will need to have additional spacers to push the wheels farther out on the axel, because otherwise the wheels have too much side-to-side wobble, even when the axel nut is fully tight. I find these wheels to be slippery when I am trying to do edges, but tight when I am trying to do one-foot turns. I did skate on these wheels for many years, and I still have a set of the 101s that I use on occasion, but in general I prefer the Roll Line and Komplex wheels for use in the harder dances that have deeper edges and one-foot turns. Star: The Star wheels are a hard to find figure wheel. They have several levels of hardness, and are preferred by some skaters to the Giotto. Some people say that the hardest Star wheels are even slicker than the hardest Giotto wheels, and thus feel that they get better roll around the figure circles. However, I have heard that these wheels can be expensive, they are hard to find (in the US at least), and I have seen fewer and fewer skaters using them in recent years. Snyder: The Snyder skate company has been producing skating plates in the US for quite some time – they used to be quite popular, but are now used much less by artistic skaters in favor of Roll Line and Atlas (these still seem to be very popular with the Derby crowd though). Recently, Snyder also started making skate boots and wheels. I have only seen a few people use the wheels, and they usually move on to another brand within a year. I haven’t skated on them myself, and don’t know anyone who uses them, so I can’t really speak to how they feel. Hyper: The Hyper brand of wheels is no longer made, but occasionally you will see people sporting a really old pair of Hyper Tracer figure wheels or Hyper Dance wheels. I did use the Hyper Tracer figure wheels when I first started skating, and liked them, but I prefer the Giotto wheels for turns and length of roll. I tried the Hyper Dance wheels once – they were not good. Probably the slowest wheels I have ever skated on. Ever. STD: STD is a skate company that mainly seems to be sold in Europe. Many of their products looks like knock-offs of Roll Line and Komplex wheels. The only place I have found selling their wheels is SkateCrazy – a UK based online retailer. I have heard that there are some European skaters who like their MEST wheels, but in general I have not heard many reports about their wheels (favorable or otherwise). No one in the US is using them, as far as I am aware (import and shipping would make them far more expensive than Roll Line or Komplex here), and so I have very limited knowledge of how these wheels actually perform. So, overall it should be pretty apparent that the wheels you use have a lot to do with what you are trying to accomplish. Wheels are one of those things that every skater needs to test and feel for themselves. While general recommendations are good, it is hard to be really confident with your selection unless you try it out for yourself. 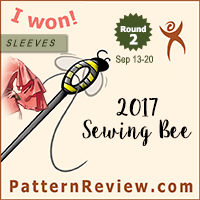 Personally, I am a fan of the Roll Line wheels, but I am recently starting to like the Komplex Bolero for dance, at least on tighter surfaces. I am probably going to stick with my Giotto wheels for figures and loops, while I might bounce back and forth between the Roll Line Grease and Komplex Bolero wheels for dance. If the Roll Line whining issue doesn’t resolve itself, there is a strong chance of me switching strictly to the Komplex wheels in the future. There are many (many many) other brands and styles of skating wheels, but these are the ones most often used in the artistic community. Over the years I have seen the popularity of various skate wheel wax and wan, but there always seems to be something new to try, as well as something falling out of popularity and off the market. The population of roller skaters has seen a drastic decrease since the 70s and 80s, with the number of artistic skaters being dramatically reduced because of it. With such a small market to sell to, sometimes it is a wonder we have as many choices as we do, but other days it feels very limited. Unlike other skate parts (like boots) where we can benefit from the popularity of ice figure skating to have a wide range of choices, artistic roller wheels are unique to our ever shrinking sport, so it is always exciting when new companies (like Komplex) offer something new to the skating market. So, any other skaters out there? Did I miss any of the big wheel brands? Which wheels do you like? Have you tried the new Komplex wheels and what do you think? Do you switch your wheels depending on the skating surface? Do you have brand loyalty, do you like to try out the latest thing, or are you still lamenting the loss of the Hyper Tracer Figure Wheel? Discuss! Yes, I will agree that the Komplex wheels do turn very easily. I still like my Giotto wheels for figures, but I am liking the new Bolero wheels I got for dance. I think the Komplex wheels could be really good for creative – definitely there will be a lot less resistance on the turns than on the Grease. I think right now I am on a Grease kick because we are going to have a competition or a large, bumpy, slippery floor in a few weeks and I think the Komplex might be too slippery. I wore Grease last year and liked them, so I think I am going to use those again, and then use the Komplex on the much tighter and smoother floor I should be skating on later this summer. What a great review – thanks for posting this. I had a set of Grease 95As that I got several years back that I got when I sent my skates off for an Atlas plate upgrade (to SkatesUS). When they came back – with a recommended cushion configuration, new wheels and bearings and this new plate – I was horrified that I wouldn't be able to skate on them, as comfortable as I had been with my long-time affection for Powell Bones Elite 101A wheels and old plate. However, after 20 minutes on them, it was an epiphany to actually feel the floor as well as I did with this new equipment and adjustment. I should have started this post by stating that I'm originally a competitive ice skater from the days when we did figures as well as freestyle, and I was an ice dancer too. Roller skating is a pleasure, not as much of a discipline, as ice skating was for me, so I'm still learning the ins and outs of the roller world. I love it, though, and so greatly appreciate your insights. One thing: I did order a set of Roll Line Grease 97As from SkatesUS and was disappointed in the new profile of these wheels (and sent them back) because instead of the wide stance of my original Grease wheels, these were contoured in from the hub on the back side of the wheel to a narrower profile than the original. I wasn't ready for this and wondered whether these were even original wheels or if they had been altered! Have you noticed this about the new Grease wheels – is this what you meant in your post? 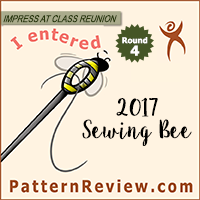 Please let me know – I am really happy to await your knowledgeable reply! Yes, the new, more narrow profile is what I meant in the post when I said that there is a new design. I too prefer the older, wider version of the wheel. My newer set of wheels makes this incredibly annoying whining noise, and it feels like I am skating on a very bumpy surface. I have heard that there was a brief period where the wheel mold wasn't quite correct after they changed designs, as people who are now getting the wheels do not have that problem. However, I was annoyed at having spent a lot of money on the dance wheels and then having them not be very comfortable to skate on. I went back to my old wheels for a while, but they are pretty worn by now, so I have switched to the Komplex wheels for the time being. The Komplex wheels are not as wide as the old Roll Line Grease wheels, but they are nice to skate on. I have been using the Bolero wheels in the 40 hardness, which seems to provide the best mix of grip and roll. A lot of people seems to be switching over to these wheels at my rink, and most of them are happy with the switch. Thank you for so much information that is really hard to come across. I am predominately an outdoor dance skater and wanted to reduce the weight of my skates, which are close to 4.5 lbs ea complete skate. I have original Kyptos 65mm 78As from the 80s. I was looking at the Roll-Line Helium 64mm 84A. Is this the closest match out there where I can reduce the most weight from the skates? also, is there a regular or short figure skate boot that is 1/2 the weight of a Riedell 220 boot? I recently had the opportunity to compare the Komplex, Roll line and Bones Wheels. While practicing for the 2016 national championships where I competed in the Premier gold solo dance event I had been practicing on the Komplex Wheels with reoccurring flat spots (under normal skating conditions). Another skater in our club had some bones 103 62 millimeter Wheels that they weren’t happy with due to the size. When getting those wheels it made a tremendous difference due to the extreme roll. I have skated on Bones wheels for a number of years preferring the 62 millimeter 101 hardness wheels, however I found that with the 103 hardness wheel there was an very noticeable difference with the role I had. On the downside with the additional roll and hardness of the wheel they were somewhat slippery. So prior to skating the Nationals my coach offered me a pair of the Roll line Ice dance Wheels when I put them on for practice at the national championships the slowness of the wheels made it very difficult to adjust, so I quickly changed back to the bones 103 62 millimeter Wheels and I believe the role with a sacrificing some grip helped to make my performance seem effortless. Believe I will be staying with the Bones wheels.